Men have been yearning to learn of the mysteries of life, the universe, and our world since the beginning. Genesis 4:20-22 recounts the start of livestock husbandry, musical instrument making, and metal forging. By Genesis 11:3-4, not long after the Flood, people were building with the invention of bricks and mortar. They were also once again rejecting God and substituting their own selves for the deity as had occurred in Genesis 3. Man sees himself as God and as such he looks for answers within himself, using his own capabilities, never acknowledging that life itself is a gift from above, as is power (John 19:11) and even the conscience. (Isaiah 30:21, Romans 2:15). But that doesn’t stop today’s scientists for looking for answers in all the wrong places. Or, they look for answers to the big questions of life in the right places, but fail to see or acknowledge God as the originator, author, architect, and ultimate Source. Answers to the deep mysteries of life are not scientific, because they are supernatural, being originated from God. Science can only go so far. I love science and I see God’s fingerprints all over it. The Bible is not a book of science, but it is a book of answers. If you have a biblical worldview, science fits right in. It’s the secular worldview that makes scientists perplexed when things don’t fit in, because they look, but do not see. (Matthew 13:13). The BBC Documentary Atom is a multi-part series narrated by British physicist Jim al-Khalili. He makes particle physics and quantum physics understandable. Well, he makes a lot of it clear, lol, but not all of it is clear in my puny mind. That doesn’t matter, because where I fail to make connections scientifically, I can see the answers biblically. And that’s enough. Here are some examples of what I’m talking about. Early in the series, the narrator is describing the scientists’ upset of discovering that everything is made up of atoms. 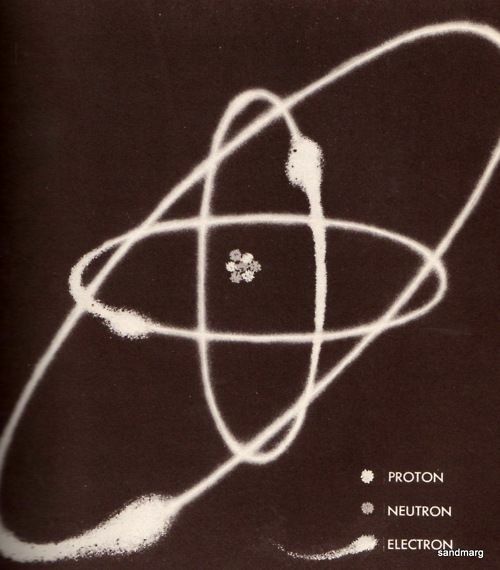 Then they got more upset learning that atoms are (seemingly) mainly empty space. If you picture a football field, with the center being the nucleus, and a soccer ball rolling around the edge of it, that’s the proportional distance. How does the electron know to remain in orbit around its designated nucleus? Why doesn’t it dance off to another location, and what holds it there? These questions were posed in the documentary. There is a scientific answer. But also, there is a biblical answer. And he is before all things, and in him all things hold together. Colossians 1:17. Jesus holds the electrons in their place. In this section of the documentary, al-Khalili explains how genius Paul Dirac sought the unification solution before Feynman came up with it. Dirac is quoted as saying “a physical theory must have mathematical beauty”. The disparity between special relativity and quantum mechanics was not just inconvenient to Dirac, it was downright ugly. The soul thirsts for God and not just a utilitarian God. We intuitively understand that God is orderly. His perfections include symmetry, and beauty. If the world emerged from a bang and chaos, why did it evolve to produce such beauty everywhere? The universe must be harmonious, it just seems right to believe this, as Dirac was sure of. Will our art be beautiful or ugly? Harmonious or cacophonous? Orderly or chaotic? Once we see that God is the foundation of Beauty, since He Himself is Beauty, we shall see that God is the ultimate artist. He spoke and worlds were created. His word of order triumphed over the chaotic abyss present in Genesis 1:2. Any example of creation points to His majestic artistry. God made the worlds beautiful and pronounced it all good. Dirac’s quest for a harmonious resolution of all things is an innate understanding that beauty comes from the Originator of it, God Himself. Not just colors and such, but even the laws of nature are beautiful, harmonious, and elegant. 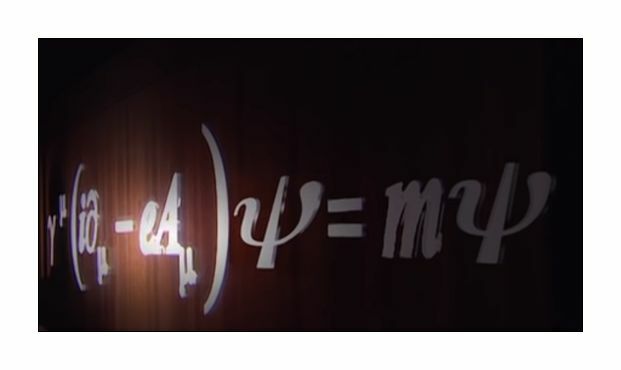 I don’t understand Dirac’s equation above, and I have a hard time understanding matter and antimatter. But biblically I do understand a parallel universe. Think of the Transfiguration. Peter, John, and James are atop Mt Olive with Jesus, and when Jesus is transfigured, He is suddenly talking with Moses and Elijah, who have appeared out of nowhere. And behold, there appeared to them Moses and Elijah, talking with him. (Matthew 17:3). Then Elisha prayed and said, “O LORD, please open his eyes that he may see.” So the LORD opened the eyes of the young man, and he saw, and behold, the mountain was full of horses and chariots of fire all around Elisha. (2 Kings 6:17). Note that as the two men appeared, they were already talking with Jesus. Jesus exists in all places at once- He is omnipresent. Heaven is that alternate universe Dirac and other scientists have discovered. It is next to us, close, somewhere in a parallel dimension. When we die, our bodies remain here, but our soul goes there. A multiverse does exist, one that’s here and one that’s there where the dead go. Who are living. Matter and antimatter? I don’t know, but I am sure the two worlds, exist, not because of an equation, but because Jesus told us there was. In a fourth example from Atom, physicist Richard Feynman pushed the envelope further than Dirac. He played a large part in developing the next phase of quantum mechanics. 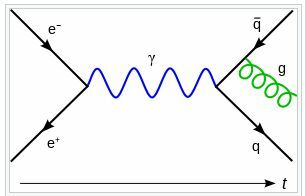 Like Dirac’s antimatter equation before, the intent of Feynman’s new theory was unification. He aimed to explain how everything works, through the electromagnetic field. Once again, the theory is called quantum-electrodynamics, or QED. QED is difficult to understand, said Feynman. Even he didn’t understand it, he said. But at root, it explains that empty space isn’t empty. Even in a vacuum, there is stuff and the stuff is heaving with activity. Atoms borrow energy from the future, and pay it back again very quickly. This exchange is repeated billions of times with many matter and antimatter particles being created and destroyed very quickly. But what it tells physicists is that ultimately the activity of these electrons popping in and out of existence, are simply leftovers of a deeper more permanent reality. Yes. That’s called heaven. ‘Empty space’ is seething with energy we can’t feel and particles we can’t see. For example, angels both holy and unholy are spirit beings, but pop into physical existence. Somehow. The deeper, more permanent reality is the one that’s there, after death. The reality we experience in this temporary tent called a fleshly body is the impermanent one. A final unification of these two realities that the physicists feverishly seek, will be completed after the universe is melted in a fervent heat and remade. (2 Peter 3:10). Life in heaven that’s going on now with Jesus, the angels, and dead souls, and life on earth, with living people breathing and working and consciously producing what they (we) believe is finite reality, will unite. The biblical view of this is not that a force that connects all things is a magic trick, but that it is the scriptures explaining God to us. The Son is the radiance of God’s glory and the exact representation of His nature, upholding all things by His powerful word. (Hebrews 1:3). The Bible is not a book of science, but it is a book of answers. Where physicists are stumped, or marvel at mysteries, or deem the foundational properties of God’s work as a magic trick, we understand that He revealed Himself to us through His creation. It is wonderful that men seek to understand through harmonies of art, music,and science, but ultimately the answers are contained in God’s mind, and insofar as He has revealed some answers to us, we can and should read them in His word. Where science fails, and it does, many times, we believers have the knowledge of Him who created all things, and is before all things. Sadly, peering into the great mysteries didn’t bring Dirac closer to God, it actually hardened him into worshiping the creature instead. the laws of nature should be expressed in beautiful equations. Dirac was a genius, who advanced our understanding of how the universe works in measurable and interesting ways, but he is dead now. Now he knows the truth. He has the answers, but they are not helping him in any way. Jesus is the answer, He is before all things. Thank you for this post, dear friend! What a beautifully written, God glorifying, explanation of the way a Christian should look at science. May God bless you! Thank you so much! Thank you for reading. God bless you as well.